Tiffany Ann Sfikas and Jeffrey Weiss had hoped to finish in the top six in senior pairs at the 2004 U.S. National Figure Skating Championships in their first season together. Tiffany Ann Sfikas and Jeffrey Weiss had hoped to finish in the top six in senior pairs at the 2004 U. S. Nationals in their first season together, but only placed 14th. Seeking additional training time, the couple decided to move from Calif. to Oldsmar, Fla. after last season. “Tiff and I decided to move to Florida in March, when we were offered more ice time at the Tampa Bay Skating Academy,” Weiss said. “We moved in April, and are currently training under Pauline Gasparini, Lyndon Johnston, Jim Millns and Petr Barna, who handles our jumps. We are very excited about the opportunities that have been presented to us at this venue.” Last season, they trained in San Jose, Calif. with Tracy Prussack and Kevin Peaks. Weiss has always been fascinated by the martial arts and began training at the West Coast Martial Arts School in Willow Glen, California when he was 23. He studied a mixed martial arts system developed by Master Ernie Reyes, Sr., one of the pioneers of the modern martial arts school of thought. According to Weiss this system combines the best of Tae Kwon Do, Muay Thai boxing, Western Boxing, Escrima, Kung Fu, Ju-Jitsu, and grappling to create a separate, and highly efficient art form. Weiss is a first degree black belt in Tae Kwon Do. Weiss began skating when he was four when his parents took him and his sister, Julie to the rink. “I displayed an early propensity towards pair skating, as my first partner, Melissa, and I, teaming up at the ripe age of seven, earned many medals skating to “Zippity-do-Dah,” he remembered, but she outgrew him. Later Weiss teamed with Erin Elbe, taking the silver medal in junior pairs in 1995 at U.S. Nationals and placing 12th and ninth at the 1995 and 1996 Junior Worlds. After Elbe retired, Weiss moved to the University of Delaware to train with Ron Ludington. “After studying under he and his wife Karen and the staff at the University of Delaware for nearly two years, I found myself to have developed a much broader sense of what it means to be a pair skater, and what it takes to become a champion,” Weiss said. But his partnership with Christie Moxley ended and he returned to California, leaving the sport for a year to attend De Anza College in San Jose. Moxley later switched to ice dancing and competed in senior dance with Alexander Kirsanov. “While the pursuit of academic goals holds a very strong place in my life, nothing supercedes my desire to be a champion figure skater,” Weiss emphasized. “This inner drive has been with me for as long as I can remember and it was during this time away from the ice that I began to see and appreciate this motivation for what it truly is. So, with a new outlook on my reasons for skating, I decided to accept an invitation to the USFSA Pair/Dance Partnering Audition, where Jesi Miller and I teamed up as one of the only teams to come out of that year’s camp. Miller and Weiss placed sixth and seventh at the 2000 and 2001 U.S. Nationals, but the partnership ended in 2001, leaving Weiss to look once again. Sfikas competed in both singles and pairs, taking a pewter medal in senior ladies at the 1998 South Atlantics before competing in the 1998 Eastern Sectionals with a broken fibula in her right leg. Her first pairs partner was Josiah Modes, with whom she finished fourth in juniors at the 1998 U. S. Nationals after winning Easterns. During the 1998-99 season, she skated with Bert Cording, finishing tenth in senior pairs at Nationals. Then in the fall, Sfikas moved to England to compete with Andrew Seabrook for Great Britain, winning their first British pairs championship in 2000. They finished tenth at the 2002 Europeans before Seabrook retired from skating prior to the 2002 Worlds. She then tried skating with Mike Aldred, but the partnership ended badly. “We enjoy the bond with your partner and having someone there by your side in good times and bad,” Sfikas said. “We really enjoy the thrill of the pair elements. Pair skating takes major strength and focus. We both enjoy doing pair spins, death spirals, and lifts. Jeff loves the twist, while I love throw triples.” They are currently doing side-by-side triple toe loops and triple salchows and throw triple loop and triple salchow in this year’s programs. Sfikas landed her first triple jump, a triple salchow, when she was 13, while Weiss landed his first triple toe loop at 17. In addition to her skating exploits, Sfikas was also a “pageant girl” In her senior year of high school, she won Miss Teen of Chicago and participated in the Miss Teen of America Pageant in San Diego, California, winning the talent portion of the competition in which she displayed a video of herself skating to Sweet Home Chicago and recited a speech. She has also appeared in Seventeen Magazine. She now does some modeling work for skating wear. As for her career aspirations, Sfikas would like to skate professionally in shows, then coach skating. 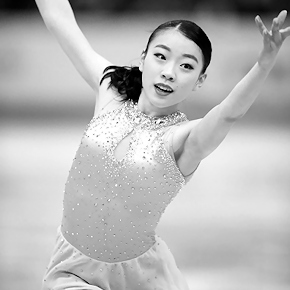 Both she and Weiss already teach skating in Oldsmar to pay for their training, although they are actively seeking sponsors. Weiss has also found a niche as a personal trainer for the skaters and their parents at the rink.